Thank you for all of your lovely comments on the Simplicity top. Doesn’t it feel great when you finish a project that’s been lingering around since forever? A huge weight has lifted off of me! LOL! I finally found some fabric for the New Look 6774 Dress. It’s pretty bold, not my usual modus operandi. But I just need a change, and going bold seems appropriate for this summer. 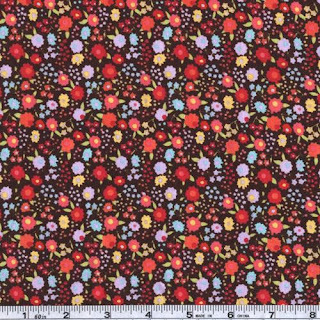 Cotton print from Fabric.com: Fabric for bodice and skirt. 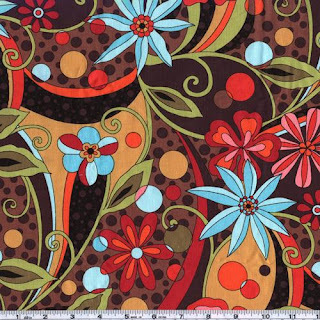 Fabric for bodice trim and/or waistband and tie. I have been working on my Kimberly Bag, but unfortunately, I won’t be able to finish it in time for the Pattern Review Make-Your-Own-Handbag Contest. Most of the purse is done. I just have to attach the bottom. I’ll probably wait to post pics when the bag is actually completed. No, I haven’t forgotten about my SWAP. I’m just not going to sew it exclusively. I plan on sprinking some other projects in between just to keep things FRESH. Concerning the SWAP, I want to whip up some “easy” sewing projects. They always make me feel so productive! LOL! The New Look 6470 top and the Vogue 1020 separates will be a good candidates. They’re already cut out, marked, and ready to sew. Love your fabric choices for maxi dress! Really will look good together. Loving that fabric you pick out!I can’t wait to see that Kimberly bag!! Wow you a lot going on!! I love that pattern and the fabrics you picked are perfect for this project! Yay for prints! You have really been busy! That’s always inspiring to me! I absolutely love your print too, perfect for the dress, and perfect for summer! LOL! I know you are glad!! I have the fabric to make that dress, but haven’t done it yet. Then today I was out and picked up a few of the new summer Simplicity patterns. They still aren’t on the website! Yeah, I’ve been feeling bold prints lately. I think that print was really popular, because I noticed that Fabric.com removed it from their website. Glad I got mine when I did! I LOVE that bold print! I am SO into prints right now it is insane!! !